Andy Palmer laid out the Aston Martin's plan for the next few years, which will involve introducing seven new products over each of the next seven years and move the company into a more traditional seven-year product cycle. Editor's note: A previous version of this overstated Daimler's stake in Aston Martin. Daimler holds a five-per-cent stake in Aston. TORONTO -- Some say a low-volume automaker like Aston Martin cannot survive without being bought out by a large automaker, but CEO Andy Palmer begs to differ. “I’m sure there are plenty of pundits who would say Aston Martin can’t survive without being bought by a big car company,” he said while pointing out that 5 per cent of its shares are owned by Daimler, which gives the marque access to modern technology that would otherwise be the most challenging facet of attempting to operate on its own. Palmer laid out the company’s plan for the next few years, which will involve introducing seven new products over each of the next seven years and move the company into a more traditional seven-year product cycle. The DB11 was the first car and will be the primary platform for future vehicles, he said. A new Vantage is next, followed by the Vanquish in 2018, the DBX crossover in 2019, a mid-engine sports car in 2020, then the first vehicle in the relaunched Lagonda line in 2021 and the second in 2022. The Canadian market averages 50 units per year for Aston Martin, and while the marque is low-volume by its nature, Palmer said it could do better here and across North America. Aston is “a little bit like cricket,” he said. “When you’re an English guy, you learn cricket by osmosis. For me, Aston was a little bit like that. One of the ways Palmer hopes to achieve this is through the use of brand ambassadors. New England Patriots quarterback Tom Brady and tennis star Serena Williams are two such celebrities who drive Aston Martins, and who the automaker hopes to leverage in the American market. 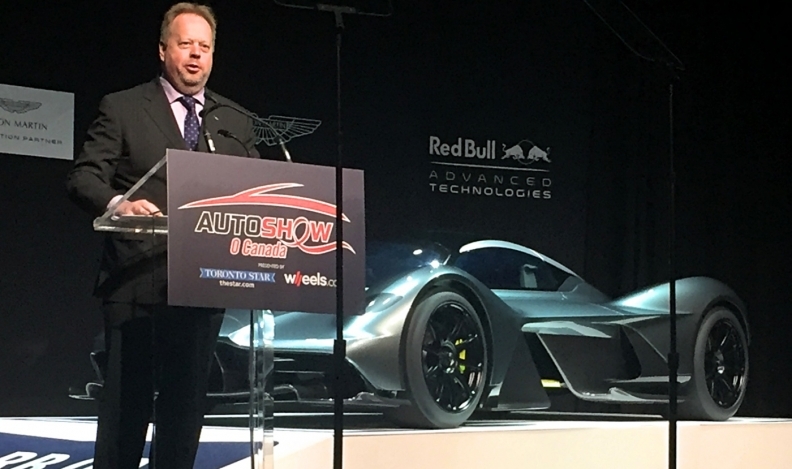 On addressing trends and how they affect Aston Martin as an ultra-luxury automaker, Palmer sees some as being more relevant than others. Car sharing, for instance, is a trend that’s on the rise but that Palmer is not looking at as an imminent concern for the company’s high-value cars. Instead, he cited specific developments in autonomous technologies such as lane departure, self-parking, and valet parking features as having more immediate relevance. Beyond those sorts of features, though, Palmer says the brand sees the connectedness their consumers want with their cars in a different light as he noted that the manual-transmission V12 Vantage is one of the company’s most popular models in North America.